and Hilda Coulsey for racing on January 1st, 2nd and 3rd. From Outi Kamarainen ... I ran the Marmot dark mountains mountain marathon this weekend. I was 2nd overall and 1st mixed team in the long score (10 hours) course with a non-harrier Jeff Powell Davies. Last Saturday evening I was thinking that it would be a lot nicer to be heading out to a pub with a nice fire going rather than out on the hills for the Marmot Dark mountains mountain marathon. According to the organisers, it is like an ordinary mountain marathon, but rather than running for two days with overnight camp, why not pack all the fun in one and do the same distance in one go and overnight so you are spared of having to sleep in a small tent. We set off just before nine pm to a windy night and despite my earlier misgivings, a few hours into the run I was really enjoying myself in the dark Lakeland fells, especially as there was a nice dusting of snow on the hills and frozen ground underfoot. It was still a tough night due to the strong wind and navigation with torch light but with good route choices and only one minor navigation error that was soon rectified, we finished early on Sunday morning with 20 minutes to spare and still in relatively high spirits, especially after we got the breakfast plates in front of us. Jean Sullivan reports ... A low key 10km road race that starts and finishes in Meltham. An enjoyable race for those who enjoy the challenge of an uphill followed by the relief of some downhill. Hills all the way until mile 5 and then a lovely descent to the end (apart from the sting in the tail of a 200m climb to the finish line!). I would recommend this race; very well organised, very friendly marshalls and a lovely pair of fleece gloves given to all finishers! What a better start to a chilly and wet January morning! From Petra Bijsterveld ... A win at Skipton this week by junior Oscar Stapleton, followed in 2nd position by Mark Mon-Williams. Over 50 Harriers enjoyed a friendly and informal evening with an excellent supper, and the presentation of the Annual Awards and League winners for 2015. Less than 30 points seperated the first three, with Michael Duffield the 2015 Champion. 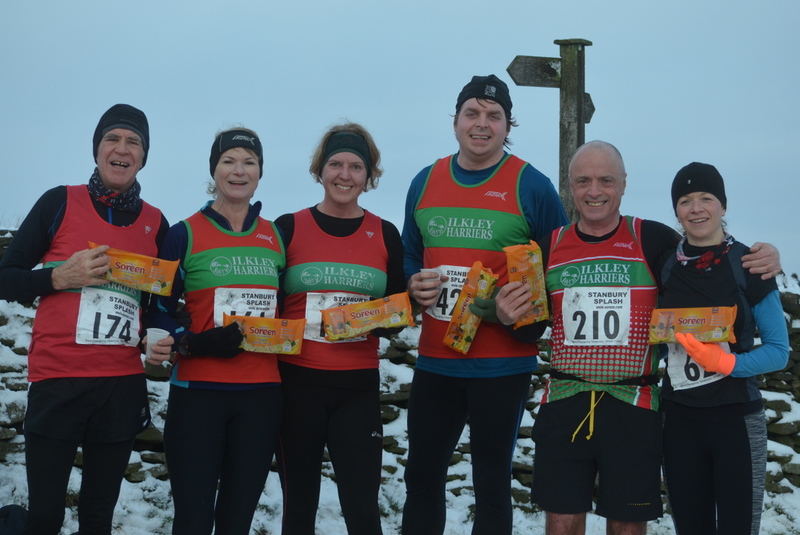 Jack Wood won the fell category, Ben Sheppard the trail/XC category, and Hilda Coulsey the road category. From Alison Weston ... Great turn out at the 4th PECO cross country race, at Golden Acre Park - the ladies finished 1st second division team and the men 2nd second division team. Thirteen ladies ran, 3 being from the same family (Joanne, Lucy and Sue Williamson). Lucy and Joanne were the first two ladies home for Ilkley in positions 14th 32:43 and 54th 36:57 respectively. Caroline Craske was third runner back in 76th position and 38:27. Other ladies included Helen Horton 92nd 39:33, Anna Nolan 96th 39:40, Gaenor Coy 129th 41.54, Hilda Coulsey 130th (2nd V60) 41:55, Allison Ricci 146th 42:43, Julie Elms 186th 45:31, Jacqui Weston 211st 47:20, Sue Williamson 222nd 47:20, Kate Lofthouse 251st 50:32 and Clare Shouler 296th 1.00:58. Steve Coy was first harrier home for the men in 54th position and 30:11 followed by Richard Joel 78th 31:24 and David Chandler 93rd 32:19. Other men included Mark Iley 100th (6th V50) 32:25, Andrew Sheldon 140th 34:08, Robert Budding 164th 34:08, Nigel Tapper 206th 37:27, Neil Bloor 233rd 38:36, Edward Bickerdyke 255th 40:03, Peter Lewis 270th (5th M65) 41.24, Don Macrae 300th (3rd M70) 45:25 and Paul Sugden 305th 45:47. A great day for the junior too with a win for Dominic Coy in the junior 2 mile course followed by Will Creske 17th, Poppy Anderson 18th (5th girl), Nathan Coy 23rd, Adam Townsend 26th, Bernadette Raven 34th (11th girl), Ben Marsden 36th, Emily Elmes 37th (12th girl) and Georgia Weston 50th (15th girl). In the junior 1 mile course Archie Budding was 7th and Dylan Shinn 28th. 444 juniors enjoyed a sunny morning racing, results and league tables on the junior site. From Petra Bijsterveld ... Tom Adams found himself in Enfield and managed to set a new course record at Grovelands parkrun, as well as finishing a full 3 minutes before number 2! From Jane McCarthy ... 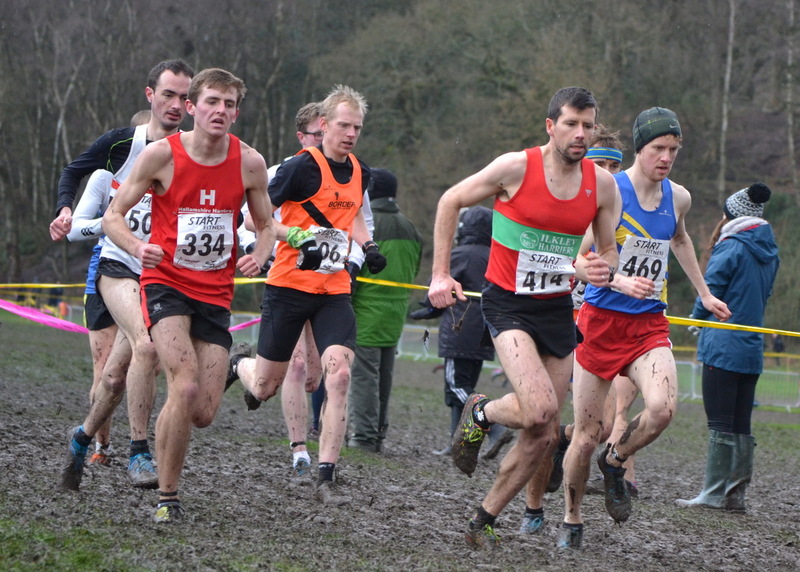 I have updated the Harriers League for the first race of 2016 - The Stanbury Splash. Tom Adams and Jack Wood make impressive starts with first and second placings, and maximum points going to Tom. There are some great races in the Harriers League this year, and the handicap system and wildcard makes it very exciting as the year goes on!! Best three races from each discipline (fell, trail and road) to count with the wildcard option for the Overall Standings, or best 4 races in each discipline. Get involved! Results and League calendar on the League page. From Petra ... We were lucky that the weather-gods made sure no snow fell on York last night, and the Brass Monkey organizers had also gritted the entire course so unlike last year there were no worries about icy patches. A beautiful sunrise and blue sky made way for overcast conditions without any wind at all, perfect running weather once the cold start was out of the way. Only 4 Harriers lined up at the start this year. Derek Oliver was first home in an excellent time of 1:27:36, which is 7 minutes faster than his time there last year. Helen Waddington was gunning for a PB and achieved her goal with a very evenly paced and fast run, finishing in 1:40:18. Very well deserved after months of dedicated training. Hilda Coulsey was home next in an excellent 1:55:21. Having not trained much recently due to various niggles I was not disappointed with my own time just outside 2 hours, I can add it to my growing collection of '2 hours and a few seconds' HM results. From Michael Lomas ... The Fan Dance Race is a homage to the military SAS/SBS selection march, a non-navigation 24km out and back over the highest mountain in South Wales, Pen y Fan. Traditionally with a 15kg pack and boots, the selection march is the same week as the race. The race has two categories, the march with the 15kg and boots or 'Clean Fatigue' with just race essentials (beyond FRA req + 2l water) and fell shoes. 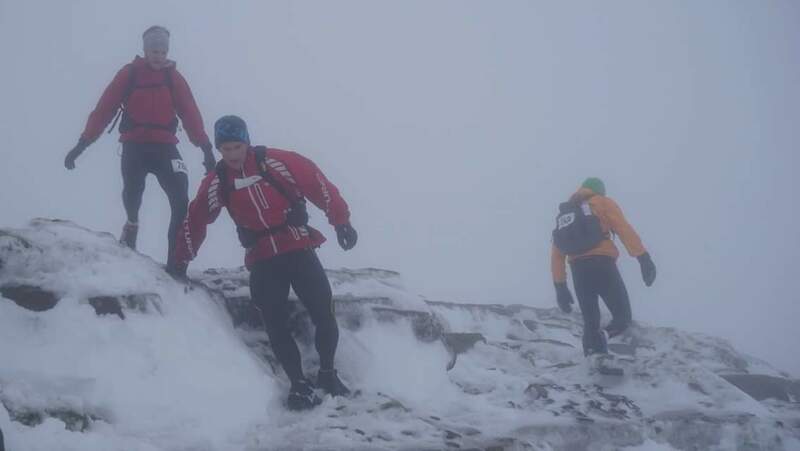 The race started next to the infamous red phone box and starts with the steep accent to the summit of the mountain, the bare path soon gave way to slush and then to full mountain winter conditions with large snow drifts and little visibility. I had started quite strong but the steep accent soon saw my heart screaming, I tried to relax a little and get into a rhythm, after the summit is a very steep decent and then an gentle gradient to the turnaround, the path all the way down is rocky and snowy but my recent concentration on descending paid off and I passed a few guys going down. At the turnaround I was able to count my position, 6th, wow, but with still half of the race to go, and knowing exactly what was to come, it meant little! I settled in to the long climb which starts very shallow and is not ideal of me, I like to be going up or down, so a couple of guys went passed. Closer to the summit the gradient picks up what feels like exponential growth, Jacobs ladder as its know is the last bit to the top, very little in the way of a clear path due to all the snow and super steep, similar to the Big End of Pendle or Whernside climb on PPP, I knew to stay well left as on the right is a sheer drop (the organiser (or DS) had already warned us of certain death if we strayed too far to that side!) At the summit I caught sight of a runner, one of the guys that I had got on the decent previous and who had come past me at the bottom of the long accent, I was quite confident I could put some distance on him on the decent, I just had to stay upright in very slippery ever changing conditions down the mountain, I finished well and put 8mins on the guy I passed on the summit, extremely happy for a top 10. I'm not too sure how long this race has been going but the DS mentioned in the results that this was the slowest and toughest race they have had yet. Ben Sheppard reports ... 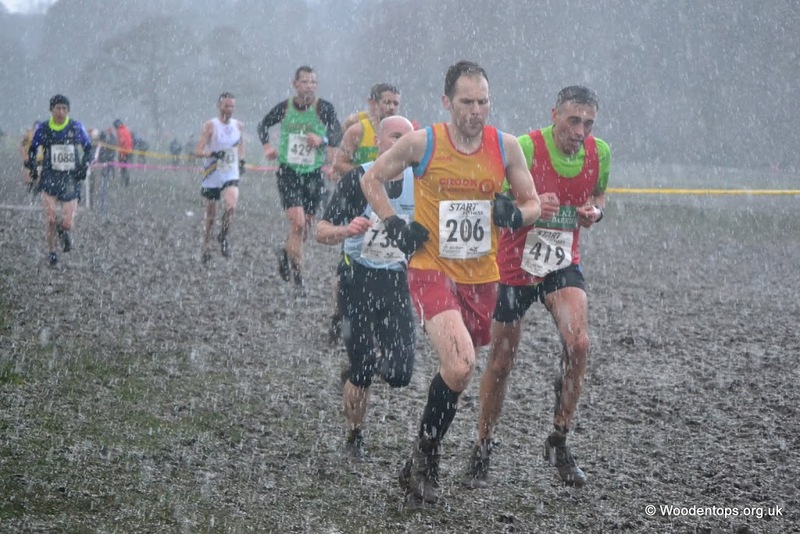 The inaugural ten mile TNT trail race - organised by local club St Theresa's AC - was a muddy affair, in places more like a cross country than a trail race. It was a great route and a challenging one in the conditions, the blend of muddy hills with sections of hard surface trails perhaps levelling the field for those of us who are neither cross country specialists nor speed demons. Alex adds ... Inaugural Temple Newsam Ten on a cold, wet, grotty day although the rain mercifully held off for the majority of the race. Predominantly off-road with some serious amounts of mud, but once you got a solid caking on your legs it did seem to warm you up a little! The course was pretty benign for the first 7 miles with just a few small inclines, but then what felt like a 1 in 3 mud bank to stumble up just before mile 8 followed by an absolute killer hill half a mile from the finish really sorted out the wheat from the chaff. Overall, good course and really well organised with plenty of enthusiastic marshalls - one for the calendar. From Gaenor Coy ... After very heavy rainy start putting up the harriers tent the rain eased for the start of the races. The course start was moved this year due ground conditions from the recent wet weather and numbered pen starts used for the first time. A fast start was essential to try to get some clear space before the first tight corner. The slightly undulating course was very soft most of the way round with big areas of deeper strength zapping mud. Tough running conditions this year. An excellent day for both junior and senior Ilkley Harriers with a grand total of 6 Yorkshire vests earned from Poppy Anderson (U13 girls), Bethan Morley (U15 girls), Euan Brennan (U15 boys), Jemima Elgood (U17 women), Lucy Williamson (U20 women) and Tom Adams (senior men). The U15 boys also came away with bronze in the team prize. A huge well done to all who ran. The final results for the 2015 League are now available! The winners will be presented at 'The Do' so 'do'come along! (Details above.) A big thank-you to Martin Wright who as League Statistician has crunched the numbers for 3 years, he is now handing the abacus over to Jane McCarthy. Also on the IH Race League Page we have the League fixtures for 2016.